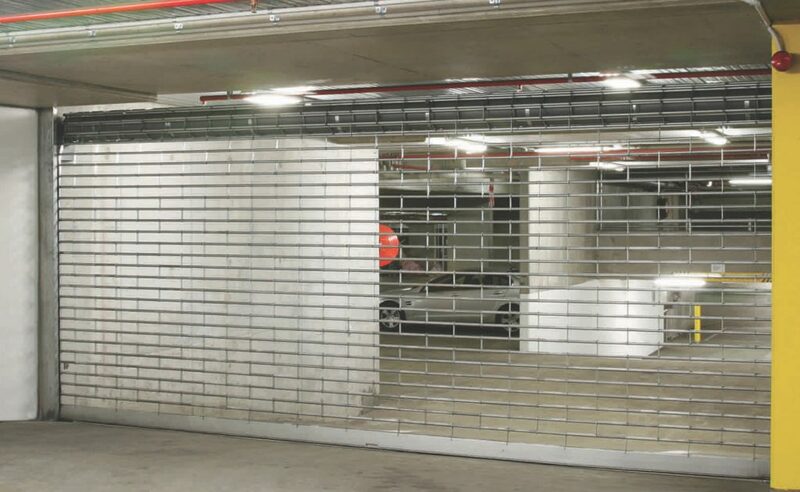 The steel security roller grille was designed specially for external doorway entrances and/or where the grille is to be chain operated or motorised. 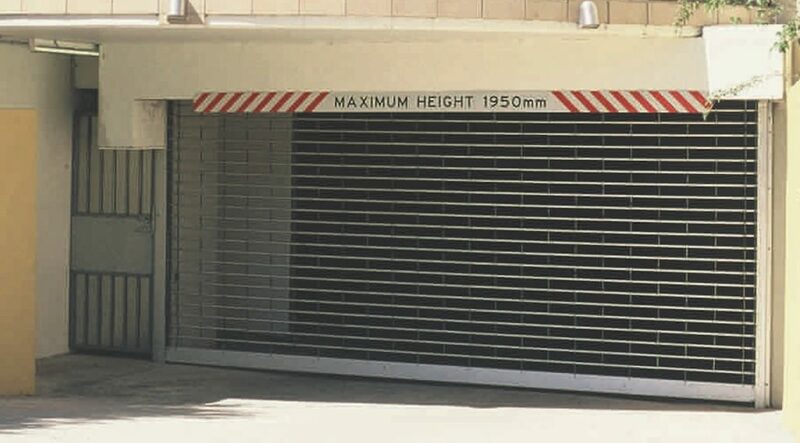 Commonly used on carpark entrances, security entrance dividers and markets. 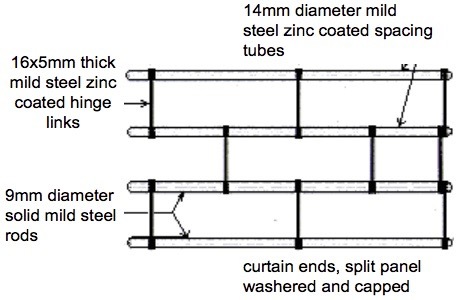 The curtain will be manufactured from zinc coated 9mm O/D solid mild steel rod, sleeved with 14mm O/D mild steel zinc coated spacing tubes set horizontally at 80mm centres connected vertically by using 16mm by 5mm thick mild steel, zinc coated hinge links at 210mm centres to form a brick type pattern. The mild steel rod ends will be split - pinned, fitted with washers and capped to prevent lateral movement within the grille curtain assembly. The bottom rail will be manufactured using zinc coated mild steel angle of not less than 50 x 50 x 6mm thick and matched to suit grille width. The roller drum will be manufactured from a seamless, cylindrical tube, encasing helical torsion springs matched to suit grille size and weight using super grade wire revolving around a steel axle. The roller drum will be designed to give minimum deflection over the grille span. The roller drum support brackets will be manufactured from mild steel plate having a minimum thickness of 6mm and/or matched to suit door size and weight. 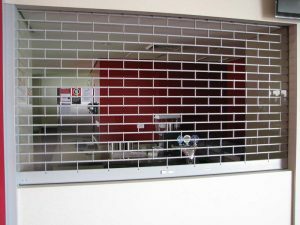 The steel security roller grille will be as manufactured by 3rd Generation Doors. The curtain will be constructed using 9mm solid steel rod, sleeved with 14mm diameter steel tube, hinge linked together using 16mm by 5mm thick mild steel flat, to form a brick type pattern and all zinc plated. The ends of the solid steel rods are to be fitted with capped and split - pinned to prevent lateral movement. The grille will be supplied with roller drum, brackets, guides and all necessary parts. 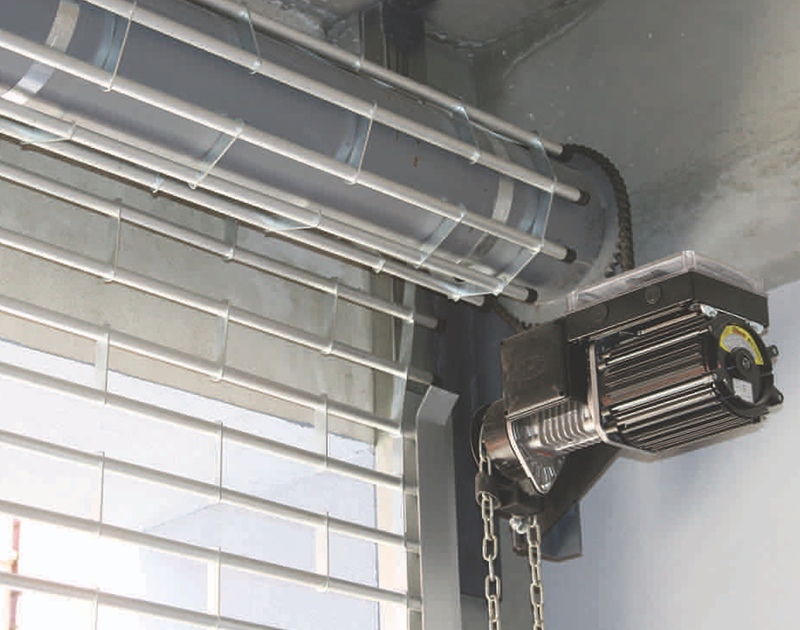 The guide channels will be fabricated from cold roll formed galvanised steel channel section having a minimum thickness of 2.5mm and minimum depth of 65 to 75 depending on grille width, matched to suit grille curtain thickness and working clearance. Operation is by hand, chain or electrically motorised according to size and preference as specified. Curtain and bottom rail to be zinc plated. Guide channels to be of galvanised steel, and all other components (roller drum and support brackets etc.) are given a coat of zinc chromate primer.